Union Square and Alcatraz Island are good opportunities to explore the local culture. Deepen your sense of the past at sights like City Lights Booksellers and The Embarcadero. Next up on the itinerary: see what you can catch with a fishing tour, take a tour by water with Boat Tours & Water Sports, see the interesting displays at San Francisco Maritime Museum/Aquatic Park Bathhouse Building, and take in the waterfront at Fisherman's Wharf. To find more things to do, ratings, maps, and more tourist information, you can read our San Francisco day trip planning site . Use the Route module to find travel options from your starting location to San Francisco. In May, daytime highs in San Francisco are 69°F, while nighttime lows are 53°F. Finish your sightseeing early on the 24th (Fri) so you can travel to Portland. On the 25th (Sat), get engrossed in the history at Lake Oswego Preservation Society, look for all kinds of wild species at Oaks Bottom Wildlife Refuge, then browse the eclectic array of goods at Portland Saturday Market, and finally look for gifts at Powell's City of Books. To see maps, ratings, photos, and more tourist information, use the Portland travel app . You can fly from San Francisco to Portland in 4 hours. Other options are to do a combination of train and flight; or drive. In May, plan for daily highs up to 70°F, and evening lows to 51°F. Finish your sightseeing early on the 25th (Sat) so you can drive to Hood River. The city of Hood River is the seat of Hood River County, Oregon, United States. 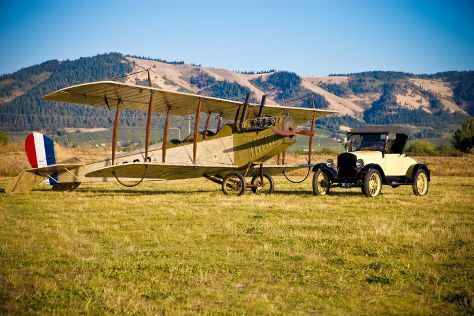 Kick off your visit on the 26th (Sun): examine the collection at Western Antique Aeroplane & Automobile Museum and then explore the activities along Columbia River Gorge National Scenic Area. For photos, ratings, traveler tips, and other tourist information, read Hood River trip planner . You can drive from Portland to Hood River in 1.5 hours. Alternatively, you can take a bus; or take a train. Expect a daytime high around 67°F in May, and nighttime lows around 49°F. Finish your sightseeing early on the 26th (Sun) so you can drive to Cannon Beach. Cannon Beach is a city in Clatsop County, Oregon, United States. Kick off your visit on the 27th (Mon): kick back and relax at Cannon Beach and then explore the striking landscape at Haystack Rock. On your second day here, enjoy the sand and surf at Hug Point State Recreation Site and then enjoy the sand and surf at Manzanita Beach. Before you visit Cannon Beach, use our trip planner to discover what you can do and see there. You can drive from Hood River to Cannon Beach in 3 hours. Other options are to take a bus; or do a combination of train and bus. Expect slightly colder weather when traveling from Hood River in May: highs in Cannon Beach hover around 62°F, while lows dip to 48°F. Finish your sightseeing early on the 28th (Tue) so you can drive to Bandon. Bandon is a city in Coos County, Oregon, United States, on the south side of the mouth of the Coquille River. On the 29th (Wed), look for all kinds of wild species at Face Rock State Scenic Viewpoint, then stroll through Bandon State Park, and then kick back and relax at Coquille Point. Get ready for a full day of sightseeing on the next day: tour the pleasant surroundings at South Slough National Estuarine Research Reserve, kick back and relax at Whiskey Run Beach, and then take in the exciting artwork at Second Street Gallery. To see other places to visit, ratings, and tourist information, read Bandon trip itinerary maker site . You can drive from Cannon Beach to Bandon in 6 hours. Other options are to do a combination of bus and flight; or take a bus. In May, daily temperatures in Bandon can reach 62°F, while at night they dip to 49°F. Finish your sightseeing early on the 30th (Thu) to allow enough time to travel back home.